Unda and Chammanthi (Chutney) is a great healthy snack, a nostalgic kind of snack; those hailing from Kottayam Pala region can easily relate to it. My family is originally from Bharananganam, near Pala, and Unda and Red Chilly chammanthi(chutney) is a favorite snack in my family. Unda is the Malayalam word for spherical shape, and Unda and Chammanthi is a favorite snack in Kottayam- Pala regions. 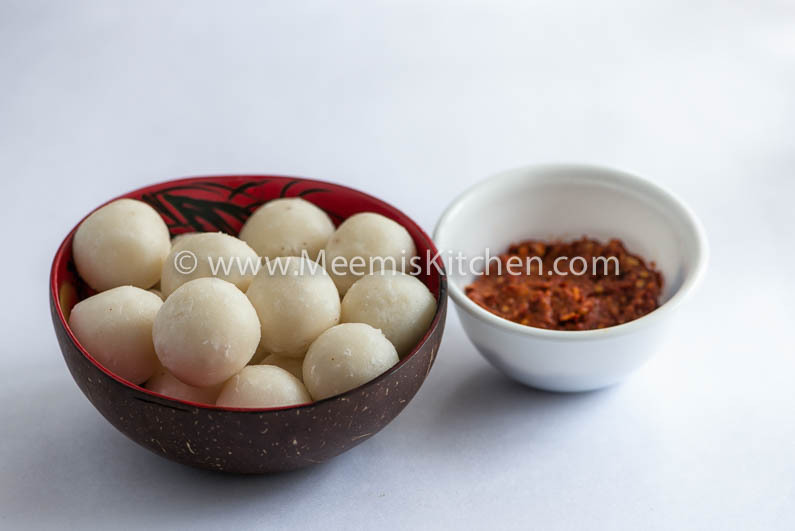 Made of Rice flour and coconut, unda are soft balls and tastes awesome with Red Chilly Chammanthi. During my childhood, whenever my mother make Kozhukatta, or even Idiyappam, the balance flour mix will be used for making Unda. We used to love it and the lovely hot hot chammanthi. The coconut oil in the Chammanthi is what makes it flavorful and tasty. Yum!!! Over the years, the spicy Chammanthi has met several improvisations in my kitchen and I am giving you the latest favourite version of the Spicy red mulaku chammanthi. You can also try the chammanthi without Tamarind, if you don’t like the tangy taste. Also, try my Onion Tomato chutney for Idlis, special thenga chammanthi for Kanji, Unakka Chemmeen chammanthi, Nellikka Chammanthi etc. . So are you ready to have hot unda with spicy chammanthi? In a vessel, mix the rice flour, salt and ghee with hot water like you do for Idiyappam. Mix well. Add ½ cup of scraped Coconut and mix well. Make small balls out of this and put in a steamer and cook for 5- 10 mts. Unda is ready. Heat a Kadai and pour 1 tsp oil into it. Sauté the small onions in it and add red chilies and sauté. Grind all the ingredients with enough salt and 1 tsp water ( if you like it running add little more water). Add 1 tsp coconut oil and mix. The chammanthi is ready. Have it with hot unda and watch the your nose sweat.. its spicyyyyyyy!!! You can make the chammanthi without Tamarind if you don’t like it tangy. 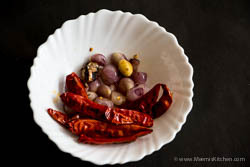 Only very little tamarind, just a pinch should be used to balance the flavors. Coconut oil must be used. It adds to the aroma, taste and flavors. Add more water (1 tbsp extra) if you like it runny. Have it hot when it is raining with your cuppa. God Bless!